110 Charles Street is a seven minute walk from the 2 LINE 2 (BLOOR - DANFORTH) at the SHERBOURNE STATION - WESTBOUND PLATFORM stop. This apartment is in the Bay Street Corridor neighborhood in Toronto. Nearby parks include Asquith Green, St. James Town West Park and Cawthra Square Park. 110 Charles Street has a Walk Score of 98 out of 100. This location is a Walker’s Paradise so daily errands do not require a car. Don't miss this opportunity to move into the dynamic Yonge and Bloor area. This stunning 2 bed, 2 bath corner unit is approximately 800 sqft with parking and locker as well as insuite laundry included. Features include designer kitchen, engineered flooring, and floor to ceiling windows. Explore how far you can travel by car, bus, bike and foot from 110 Charles Street. 110 Charles Street is a Rider’s Paradise which means world-class public transportation. Car sharing is available from Zipcar. 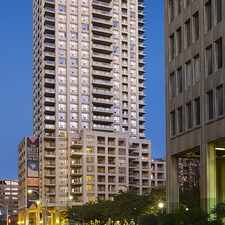 110 Charles Street is in the Bay Street Corridor neighborhood. Bay Street Corridor is the most walkable neighborhood in Toronto with a neighborhood Walk Score of 99.